Designed by Shed Architecture & Design, the Madrona Passive House combines contemporary design with energy efficient building systems, creating a home that’s eco-friendly to both its environment and its owners. While incorporating energy efficiency into a home’s construction is one of the most effective ways to build green, sustainability—a key component of building green—also can be achieved through other means. Many builders, including Hammer & Hand, follow guidelines set forth by the Forest Stewardship Council (FSC). Just like agencies that certify organic foods, the FSC sets standards for forest products in an effort to guide architects and builders toward sustainably sourced building materials, such as certified lumber and flooring. 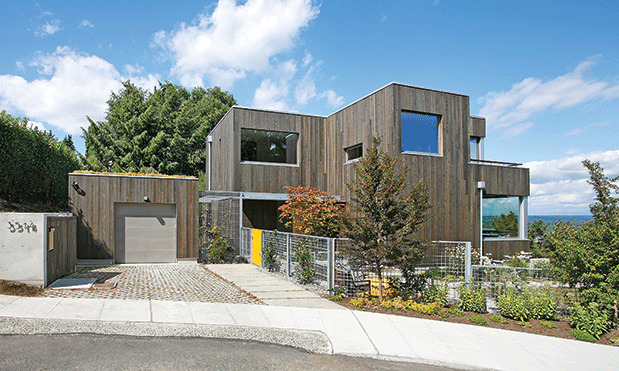 “Because of the sheer quantity of wood in most residential projects, it’s one of the ways in which we can hold contractors accountable for the materials they source in regards to both construction lumber and finished cased goods and paneling,” says Max Mahaffey, project manager and designer with Seattle’s Shed Architecture & Design. The cost of optimizing a home’s energy efficiency runs a little more than a traditionally built home; generally, from 5 to 10 percent more, says Whitmore. The payoff is in the long run, with super-low energy costs over the life of the home and the additional benefit of being kind to the environment. “Energy-efficiency measures have a relatively small immediate return, but the cumulative environmental impact can be tremendous,” says Whitmore. The heating expenditure for Hammer & Hand’s passive house in Madrona was less than $45 for January through March last year. There are also plenty of options that allow owners to be green with their interior finish choices. Prentis Hale, co-owner of Shed Architecture & Design, often encourages his clients with single-family homes to consider long-lasting, high-performance finishes such as Caesarstone, a quartz countertop material that is responsibly sourced and manufactured; and eco cork, a natural and sustainable flooring product that is renewable because its source is the bark of the cork oak tree, which can be harvested several times in the tree’s lifetime. His firm also leans toward products with low or no volatile organic compounds (VOC), such as Benjamin Moore’s Aura line of paints and water-based hardwood floor finishes from German retailer Berger-Seidle. It isn’t always necessary for Hale to play the role of go-to expert for earth-friendly finishes; customers will often come to him already well versed in sustainable products. “I find that there aren’t too many uneducated clients in this town,” says Hale. “There are folks that come through our door who have done tons of research.” In those cases, Hale points them toward local retailers such as Seattle’s Greenhome Solutions (ghsproducts.com) or Small Planet Supply (smallplanetsupply.com) in Tumwater for their abundant stocks of materials geared toward the layperson. With both single-family and multifamily housing construction on the rise in Seattle, it’s more important than ever to build with sustainability in mind. Whitmore ranks energy-efficient design and construction efforts above those made toward creating cars that can optimize fuel usage. Confused by VOC, FSC, LED? Our cheat sheet will have you sounding like an eco-building expert in no time. Advanced framing: A structural framing technique used with energy savings in mind. It reduces the amount of lumber needed and increases the amount of insulation material used (using an average of 30 percent less lumber) to improve the energy efficiency of the home. Green home: When describing earth-friendly, energy-efficient homes, “green” can typically be used interchangeably with “sustainable” or “environmentally friendly.” A green home is one that uses less energy, water and natural resources than a conventional home, both in its construction and its operation. Low- or no-VOC materials: VOC stands for “volatile organic compounds,” and conventional paints, adhesives, wood finishes and carpets contain VOCs that may be harmful to a home’s inhabitants and the environment. Low-VOC materials contain a reduced number of VOCs per liter; no-VOC products contain none. LED lighting: LED (light-emitting diode) lighting is highly efficient, versatile and long-lasting. LED lights can be five times more energy efficient than incandescent and halogen sources. Net-zero Home: A net-zero home produces as much energy as it consumes through the use of solar panels, energy-efficient building systems and advanced design techniques. They are designed and built to be highly efficient. Passive house: A passive house is one built following a methodology that minimizes heating and cooling loads through passive measures, such as orientation, massing, insulation, heat recovery and solar shading. Sustainable: As it relates to design and construction, the term “sustainable” is used to refer to practices that emphasize energy efficiency and reduce the need for heating and cooling systems. Triple-paned windows: Highly efficient windows with three panes of glass separated by spacers. Often argon or krypton gas is injected between the panes to increase energy efficiency.